← Previous Post Pain! Drama! Knife Licking! 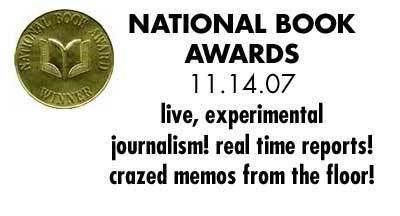 Over at bookdaddy, Weeks said that the NBCCs were the second most important awards in the country after the Pulitzers. (Or I think it was Weeks; maybe it was another NBCC member.) That sounds like a good recipe for boffo real-time reactions at the NBA. Or how about this: the Quillies – yes, the fiendish brainchild of conglomerate cynicism – included among its nominees in fiction this year a Soft Skull book and among its poetry nominees two books from small presses. How many books from indies did the Natl Book Foundation, guardian of Parnassian standards, shortlist in these categories? None.